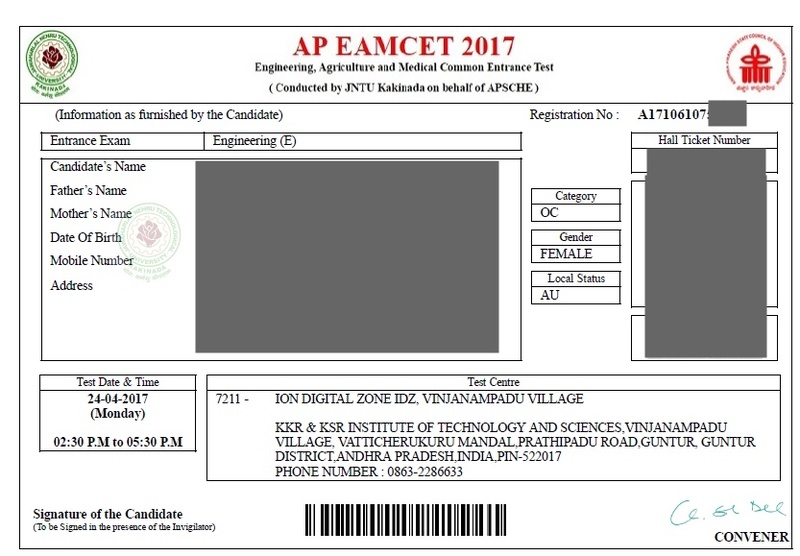 AP EAMCET 2019 hall tickets released on 18th April 2019 by JNTU Kakinada on behalf of APSCHE, 2019 through online mode. All registered candidates will be able to download the AP EAMCET hall ticket 2019. Downloading of Hall-tickets from our website Manabadi.co.in and http://www.sche.ap.gov.in/eamcet . Candidates can download the AP EAMCET 2019 hall ticket till the last date of the exam. To download the AP EAMCET 2019 hall ticket, candidates will have to enter their registration number and date of birth. The AP EAMCET 2019 hall ticket has to be produced at the examination centre. If candidates failure to bring the hall ticket may not allowed the candidates to attempt the AP EAMCET examination. Along with the AP EAMCET hall ticket 2019, the candidates have to submit the certificates like application form with attestation and caste certificate (for SC/ST/OBC candidates) to the examination centre. Candidates are suggested to read the full article to know more information about AP EAMCET 2019 Hall Ticket. In this article We are giving the full information about AP EAMCET 2019 Hall Tickets, how to write the online exam and important things to remember. Candidates are permitted to choose the exam center while filling the online application. The option for choosing exam center is provided under the â€œRegional Centerâ€� field in the AP EAMCET 2019 application form. They can select any one option from the drop down menu. In case of SC & ST candidates, the photo copy of caste certificate will also be verified along with the Hall ticket & filled in Application form. Questions are displayed one at a time in English and Telugu languages. Questions in Mathematics / Biology, Physics and Chemistry are displayed in different sections. Candidate should select the Section (Subject) which he/she would like to start the exam with. 1st question from the selected Section (Subject) gets displayed for answering or Click on the question number in the Question Palette at the right of your screen to go to that numbered question directly. Question and options for the selected question number will be displayed in â€œQuestion windowâ€�. Select any one of the four options as answer for the question, by clicking on the circle button beside the option. To mark the question for review, click on the Mark for Review & Next button. If an answer is selected for a question that is Marked for Review, that answer will be considered in the evaluation. Submit button will be not be enabled till the exam closure time. System will automatically submit your answers post Exam Closure time. Exam summary will be displayed to you with Subject Name, Number of questions, Answered,Not Answered, Marked for Review, and Not Visited. Your Exam will be successfully submitted with this confirmation.